I know this question is searchable in Our Lord Google, but I find most answers over there assumes a FX sensor, and still I don't have things very clear. Well, I'm just a beginner photographer that I entered into photography "by chance", and I'd like to deepen my knowledge and get better pictures. I started by shooting landscapes, but I found recently that I'd like to do more of cosplay photography. But since this is just a hobby and not an income job, I doubt I'll be shooting at studios, so I want to focus on events. My main event to get pictures would be the Comiket at Japan, that has the particularity that cosplayers are on the outside area (so lots of lights most of the time), on a space quite crowded, and people have to line up to take pictures to cosplayers in order. My current gear is a Nikon D3200, with the 18-55mm kit lens and a 35mm 1.8G prime lens. But since the space is limited, I've opted to take them with the kit lens (not sure if the prime would give me problems to move around, I have to check). But, although I've taken quite nice photos, its poor aperture makes the background very distracting, because as said before, it's many people moving on that space. So, I'd like to upgrade my kit to make better cosplay pictures with shallower depth of field. The recommendations on some pages are the 85mm f/1.8, the 24-70mm f/2.8 and the 70-200mm, but again they recommend based on a FX sensor and probably not thinking on shooting events, but on a set up environment or studio. Also it seems that the 85mm one would make me take just the face, and since there is a queue for shooting the cosplayers, I think moving back would be a bit difficult. And I don't even want to think about the 70-200mm one. Probably for that recommendation I would take the 24-70mm. But based on a DX sensor, is there anything better that I can take? With "better", I mean a big step in IQ. Budget is not that an issue, my wallet will cry but is resigned. Also I'll buy second-hand. So used around $1000 would be fine. EDIT: I'd like to share two examples for the same cosplayers at different focal lengths, one at 18mm and the other at 55mm. I have around the same distance for all cosplayers, in average. Based on this, Maybe I can move back a bit to fit a 24mm in the picture, but probably with my 35mm I'll be privated of full-body shoots. 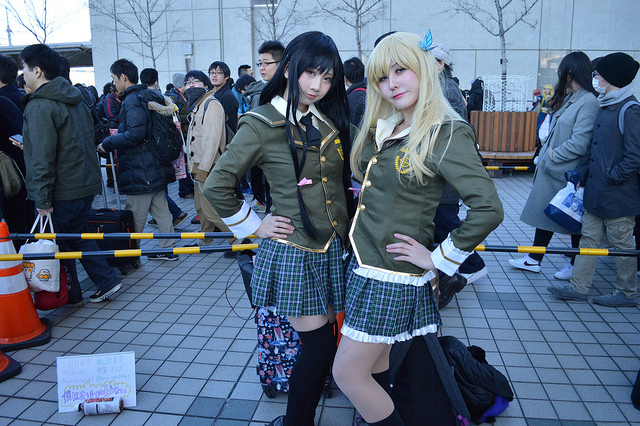 On the first one, there are many "sharp" people on the background, distracting the look from the cosplayers. If you want something that lets you shoot a person in full while being relatively close and keep a shallow DOF, you need a rather open lens. You also need a short focal length (the shorter that length, the closer you can get and leave the other photographers behind you). My first guess would be a 17-50mm f/2.8 zoom (good and wallet-friendly models from Sigma and Tamron)(this is a DX equivalent to the 24-70mm for FX). The Sigma 17-70 f/2.8-4 would also be at f/2.8 at its wide end and will give you a bit more reach if needed. But keep in mind that at small focal lengths the DOF increases so your problem is also to keep the subject as close as possible from you and as far as possible from the background. The event, Comiket, features people in costumes, on and off stage thus we are talking about a typical theatrical experience. Likely your 18-55mm kit lens is all you need for this task. A kit lens, wen set to the center of its zoom range, presents a normal view. By normal, we are taking about a view that is not wide-angle and not telephoto. Normal for this camera is a focal length about equal to the corner-to-corner measure of the imaging chip, for this camera the chip measures 15.4mm by 23.4mm and the diagonal measure is rectangle is 28mm. Thus if you mounted a 28mm, they angle of view imaged is “normal”. Wide-angle = 70% of “normal” = 20mm or shorter. Telephoto is twice “normal” or 60mm or longer. Please note: Your kit lens thus ranges from the beginning of wide-angle, through “normal” to the beginning of telephoto. Thus the kit lens is an introduction to these ranges. That being said, if you read about how lenses preform on an FX camera and you want to convert the stated focal length to be applicable to your DX, you only need to divide the focal length by 1.5. In other words, if an article in a magazine praises a 90mm mounted on an FX for a specific task, you find the equivalent for your DX by diving by 1.5. Thus a 60mm mounted on your DX is delivers the equivalent view. The math is 90 ÷ 1.5 = 60mm. This value is what we call a crop or magnification factor. Now your question deals with depth-of-field. This is the span before and after the distance focused upon that is rendered acceptable as to sharpness. You desire is to take pictures with a lens and/or setting that will deliver a shallow depth-of-field. Such a setting hopefully images the principle subject tack sharp while blurring the background. We achieve a shallow depth-of-filed via several techniques. Focus on a point slightly ahead of the principle subject. Say the subject is 10meters from you; try a manual focus setting of 8 meters. Use the widest aperture setting = f/5.6 – depth-of-field is aperture related, the larger the working diameter of the lens, the less the depth-of-field. Get close, depth-of-field is distance relater, the further back the subject is, the more the depth-of-field. Use the zoom at maximum – depth-of-field is focal length related, your zoom set to 55mm delivers shallow depth-of-field. Your main issue is DoF. However, the realities of physics are working against you. Please see this question on Bokeh with a Kit Lens: How can I get dramatic shallow DOF with a kit lens? Throwing a background requires that the background is decently far away from the subject and that the DoF is thin enough to not include the background. (Really simple explanation is...simple). The longer the focal length, the thinner the DoF at any given aperture. Most Importantly: Position your shot so that the background is as far from the subject as possible. Personally, I'd look into the 18-35 f/1.8 that Lijat mentions along with a 50 f/1.something. Possibly even throw an 85 in the bag if going to a really big venue. Pack most of your things in a backpack and keep a small hip bag/messenger bag for lenses and cards. Your lens swaps can get very fast. A 24-70/2.8 would make a good walkaround lens for either crop-sensor or full-frame because of the versatile zoom range. (Although some disagree, I prefer the zoom range on crop sensor over full frame.) Unless someone is cosplaying as a landscape, it should be fine for your subject matter. Such lenses do tend to be expensive, as you note. 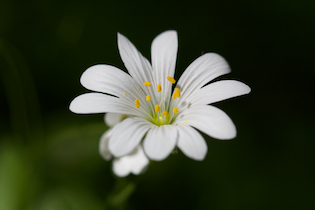 The aperture is not the only factor that determines background blur. It is possible to get reasonable results with a kit lens. Minimize camera-subject distance. Maximize subject-background distance. Use longer focal lengths. A problem with 18-55 kit lenses is people tend to use wider focal lengths than intended. Wider focal lengths counteract the ability of aperture to blur background. If you know the distance and framing you want, you can select a suitable prime, such as 24mm, 28mm, or 35mm. Why not bring your current 35mm lens to try at an event or two? 35mm is a versatile normal lens on crop sensor, and you might find it works. Worst case, you end up with photos you're unhappy with. That's pretty much your current situation, so no real loss. The one you want is the 70-200mm, it's considered a workhorse and for good reason, it's ideal for portrait but allows you to take photos at distance too. I've used a 70-200mm canon lens and had nothing but fantastic things to say about it, the 2.8f allows for good images and the range helps when you need it. The only negative is the price, however, I assume you know that since you had it listed. Not the answer you're looking for? Browse other questions tagged lens nikon equipment-recommendation event-photography or ask your own question. How can I get dramatic shallow DOF with a kit lens? Looking for a new zoom lens for a DX frame Nikon, should I get Nikon 18-200mm or something else? Which Nikon lenses for family photography? Are the Canon 15-85mm + 50mm f/1.8 adequate substitutes for the 17-55mm f/2.8?